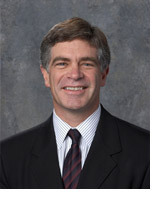 Dr. Patrick T. Harker is the Dean of the Wharton School and the Reliance Professor of Management and Private Enterprise. Dean Harker was appointed on February 8, 2000 after serving as both the Interim Dean and Deputy Dean of the school. As Dean, Dr. Harker leads over 300 faculty members, 4,600 students in the school’s undergraduate, M.B.A. and Ph.D. programs, 9,000 executive education participants, and over 81,000 alumni in 137 countries. With a budget over $260 million annually and an endowment over $475 million, Wharton is one of the premier schools of business in the world. From 1999 through 2004, Dr. Harker successfully completed the largest fundraising campaign at any business school in the world, the Campaign for Sustained Leadership, which raised in excess of $450 million. He also created Wharton West, the school’s San Francisco-based campus, as well as creating an alliance with INSEAD, the leading non-U.S. based business school. With the creation of the Al West Learning Laboratory, Wharton continues to lead the way in the use of technology in education under Dr. Harker’s leadership. Knowledge at Wharton and Wharton School Publishing, developed under Dr. Harker, extend Wharton’s thought leadership to the world through a biweekly e-newsletter with over 500,000 subscribers and through a premier book publishing company in partnership with Pearson Education Ltd.
Dr. Harker is also a Senior Fellow at the Wharton Financial Institutions Center and holds a secondary appointment as a Professor of Electrical and Systems Engineering at Penn. Prior to his appointment as Interim and Deputy Dean in July 1999, Dr. Harker served as Chairman and Professor of Operation and Information Management at the Wharton School. He currently serves as a Trustee of the Goldman Sachs Trust and the Goldman Sachs Variable Insurance Trust as well as serving as a member of the Advisory Board of Juniper Bank and is Chair of the Scientific Advisory Board for Traffic.com, Inc. In addition, he serves as a member of the Board of Managers of the Goldman Sachs Hedge Fund Partners Registered Fund LLC and as a founding member of the Board of Advisors of Decision Lens, Inc. Dr. Harker serves as a Member of the Diocesan Finance Council for the Diocese of Camden, NJ, and is also is a founding member of the Board of Directors of the National Leadership Roundtable on Church Management. Dr. Harker received his B.S.E. and M.S.E. in Civil Engineering in 1981, and an M.A. in Economics and a Ph.D. in Civil and Urban Engineering (Transportation Planning and Economics) from the University of Pennsylvania in 1983. Prior to graduation from Penn, Dr. Harker worked as a consulting engineer in Philadelphia and New York. He was a member of the faculty of the University of California-Santa Barbara prior to joining the Wharton School in 1984. Dr. Harker is the youngest faculty member to be awarded an endowed professorship in the history of the Wharton School. In January 1994, Dr. Harker was named Chair of the Department of Systems Engineering Penn's School of Engineering and Applied Science and held this position until December 1996; he was appointed as Chair of the Operations and Information Management Department at Wharton in July 1997. The naming of Dr. Harker as a Presidential Young Investigator by the National Science Foundation in 1986 affirmed his reputation as a leading scholar in the areas of service and technology management and operations research. In his thirteen-year career, he has published five books and over 80 professional articles. Most recently, Dr. Harker is engaged in the analysis of the operations and economics of the service sector. Dr. Harker served as Director of the Fishman-Davidson Center for the Study of the Service Sector at Wharton from 1989 to 1994, and as a co-principal investigator on a $6 million project from the Sloan Foundation to study productivity and technological impacts in financial services. In June 1991, President Bush named Dr. Harker as a White House Fellow, one of sixteen chosen in the country. In this position, he spent 1991-92 as a Special Assistant to the Director of the F.B.I. , as well as participating in a variety of off-the-record discussions and trips with national leaders. In January 1996, he was named Editor-in Chief of Operations Research, the premiere journal of the field, a position he held until December 1999. Dr. Harker is married to the former Emily Grace Saaty and is the father of three children: Thomas Patrick, Michael Francis, and Meghan Emma.